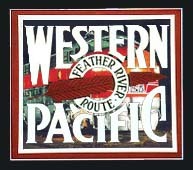 The Western Pacific Railroad was unique in many ways, from its very beginnings as a company looking for a "better way" across the mountains, and its unique way of establishing a foothold in Oakland, to the Company's refusal to degrade services on the California Zephyr, despite the enormous financial losses incurred in the effort. So, here is a look back at this feisty railroad that proudly wore the moniker "The Wobbly." A note about the California Zephyr: From 1949 through 1970, the CZ was in many ways the heart and soul -- and almost the death -- of the WP. While certain CZ items that are directly related to the WP are displayed here, the majority can be seen on their own web site, the California Zephyr Virtual Museum. This site is maintained by Alan Radecki (calzephyr@railfan.net). All items displayed are believed to be in the public domain, and are from my collection unless otherwise noted. Scans or photographs of items from other collections are invited and always welcomed, and will be credited to their owners. You are Guest number: since June 7, 1998. Thanks for stopping by!